I just returned from my eighth Trout and Tall Tales (T&TT), an alumni travel trip with the University of Redlands. When I look back at these experiences, I am reminded of the rich camaraderie and the lasting memories the University has helped to create with this annual tradition, which just celebrated its 25thanniversary. In spring of 2010, I began looking for a place to watch the Perseid meteor shower. I wanted a dark location, away from city sky glow, but with easy access and some modern conveniences. As luck would have it, I received a brochure in the mail from the University promoting several alumni activities, including T&TT. This event, led by Tom Tomlinson ’66 and LeAnn Zunich ’76, was taking place at the Hot Creek Ranch in mid-August, the same time as the meteor shower! A quick Google search showed the ranch was just a few miles outside of Mammoth, with rustic but comfortable-looking cabins. It seemed to be the ideal place for watching meteors, and I was willing to try fly fishing! I contacted the Alumni Relations team to sign up, and I am so glad that I did. That first year, I was one of three participants who had never fly fished. I had watched YouTube videos on how to fly cast, so I had a rudimentary idea of the basic moves. For us beginners, Tom and LeAnn provided loaner rods, reels, and excellent fishing lessons, patiently working with us on basic casting techniques. Tom proved encyclopedic in his knowledge of trout, including their location and eating habits in the creek. The five of us fished together and, while I didn’t catch a fish the first day, it was the most fun I’d had in years! At dinner that night, I mentioned my desire to watch meteors, and LeAnn suggested we lay out on the grass and look at the sky’s offerings later in the week. Hot Creek Ranch proved to be an excellent location for this activity. I used my “light saber” (a green laser pointer) to highlight constellations for the group (we renamed Delphinus “the trout”). 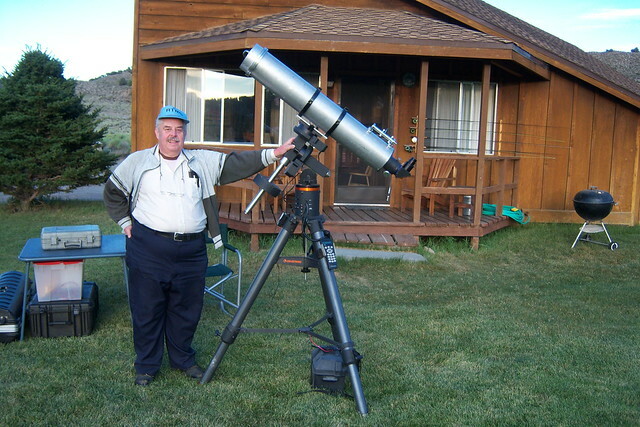 During our gazing, I mentioned that my buddy, Pat Thomas, not only had several telescopes, but also was highly knowledgeable in astronomy. LeAnn suggested inviting him and his telescope to T&TT the next year. Despite not being a Redlands alumnus, Pat joined me on my second T&TT trip. He had grown up bait fishing, but had never fly fished before. Under the tutelage of Tom and LeAnn, he quickly learned the basics. While the meteor shower wasn’t as good as the previous year, looking at stars, nebulas, galaxies, and other astronomical curiosities through Pat’s telescope was a big hit. The addition of stargazing has now become part of the trip’s annual itinerary, and I am pleased to have helped bring this to the group. It’s another way to appreciate the marvelous environment, and folks often get to see something through the telescope that they’ve never seen before. Without the leadership of Tom and LeAnn, this trip wouldn’t exist. Tom’s caring, wisdom, knowledge, and wit, paired with his many years of fishing experience, makes him the soul of T&TT. LeAnn keeps the wheels turning smoothly, bringing order and organization to help implement Tom’s vision, from assigning the cabins to planning the meals. During this year’s trip, I reflected with Tom about what makes T&TT unique. We agreed that, through the University’s alumni community, the trip brings a diverse group of people together each year, representing different ages, education, backgrounds, professions, beliefs, lifestyles, politics, and, of course, fly fishing ability. All are accepted, and each participant adds to the richness of the experience. 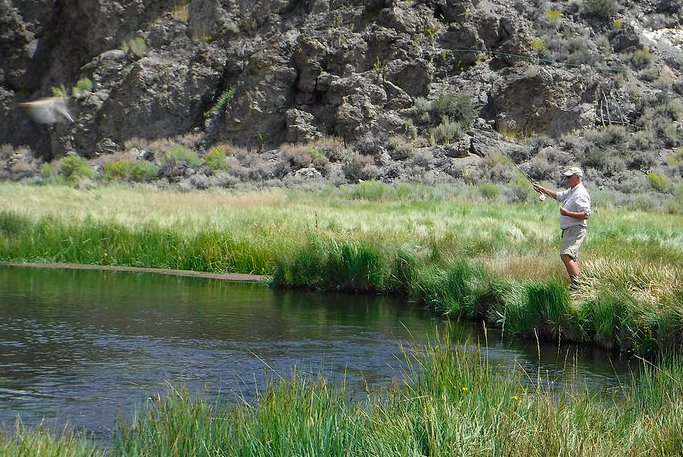 Another participant is Jennifer Pancake ’84, who learned to fly fish from Tom on the very first T&TT 25 years ago. She joined us for this year’s 25thanniversary trip and was given the distinctive honor of “spilling the wine.” This T&TT tradition dates back nearly 20 years, when Dean of Admissions Ken Corwin accidentally spilled wine on Tom’s prized copy of the book Caddisflies by Gary LaFontaine. Tom asked Ken to sign the book where the wine had spilled, and each year since Tom and LeAnn have selected an individual from the group to repeat this ritual. While Mark Triska did not graduate from Redlands, he and Robert Burks attended T&TT with their fishing buddy, John Davey ’74. He remarked on the uniqueness of the Redlands alumni group and was impressed the University’s Alumni & Community Relations team would hold an event bringing people together and reinforcing their ties with the University. Each year, on the first night of the trip, Tom reads the opening passage from A River Runs Through It by Norman Maclean, which emphasizes the art of fly fishing. T&TT is as much a celebration of the art of life as it is a fishing trip, but it is also a celebration of old and new friendships, brought together by the University in a gorgeous setting beneath the stars. View more photos from the trip by clicking the photo below.